This binagoongang baboy recipe is a variation of the usual dish because it contains coconut milk. Depending on the region, some put lots of finger chili peppers to make it spicy which resembles bicol express. But don’t confuse this dish to Bicol express. 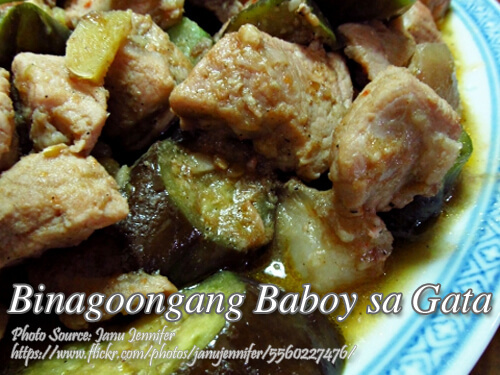 This binagoongang baboy sa gata dish have eggplants whereas bicol express only have green chili peppers. This recipe I have here is for those who don’t like spicy food. In using coconut milk, you can also use coconut cream for a thicker and richer tasting dish. To cook binagoongang baboy sa gata; Put the cubed pork belly in a small pot. Pour some water just enough to cover the meat. Cover. Boil the pork belly for about 15 to 20 minutes. Set aside. In a medium size wok or carajay, heat cooking oil and saute garlic until fragrant. Then add the onion and saute until soft. Add in the tomatoes and saute until it becomes soft and almost minced. Add in the shrimp paste and saute for a few minutes. Then add in the boiled pork. Saute for a minute then add 1/4 cup pork broth (the broth from your boiled pork belly). Simmer until the pork is tender then add vinegar, sugar, salt and pepper to taste. Add more broth if necessary. Then add the eggplant and coconut milk. Then simmer again until the liquid is thick and eggplants are soft for about 8 minutes. This binagoongang baboy recipe is a variation of the usual dish because it contains coconut milk. Put the cubed pork belly in a small pot. Pour some water just enough to cover the meat. Cover. Boil the pork belly for about 15 to 20 minutes. Set aside. In a medium size wok or carajay, heat cooking oil and saute garlic until fragrant. Then add the onion and saute until soft. Add in the tomatoes and saute until it becomes soft and almost minced. Add in the shrimp paste and saute for a few minutes. Then add in the boiled pork. Saute for a minute then add ¼ cup pork broth (the broth from your boiled pork belly). Simmer until the pork is tender then add vinegar, sugar, salt and pepper to taste. Add more broth if necessary. Then add the eggplant and coconut milk. Then simmer again until the liquid is thick and eggplants are soft for about 8 minutes. Serve hot. Hi Mike DC, Bicol express don’t have eggplant and this dish don’t have green chili peppers. This dish comes from other region so maybe this is the counterpart of Bicol express. What can I substitute for bagong? Hi E Hughes, I can’t think of any good substitute with bagoong alamang. But I read some articles that you can use shrimp broth cubes or mashed salted canned or bottled anchovies.